2ct Black Cubic Zirconia Sterling Silver Earrings Only $9.99 + FREE Shipping (Reg. $30)! You are here: Home / Great Deals / 2ct Black Cubic Zirconia Sterling Silver Earrings Only $9.99 + FREE Shipping (Reg. $30)! I love black anything, and these earrings are just perfect, especially since Halloween is coming up! 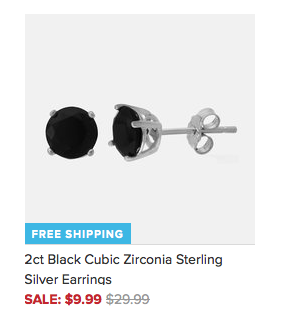 Right now, you can get these 2ct Black Cubic Zirconia Sterling Silver Earrings for only $9.99 + FREE Shipping (Reg. $30)! These earrings have the look of a 2 carat pair of black diamond stud earrings and are crafted in solid sterling silver. I am buying a pair right now myself!